Loopmasters join forces with Ultimae Records and Vincent Villuis, aka Aes Dana, for an outstanding royalty free sample collection of atmospheric sounds and field recordings dedicated to electronic music producers worldwide. 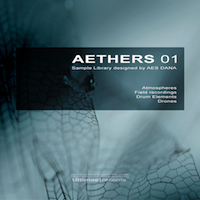 ‘Aethers 01’ contains all the ingredients you need to create huge immersive soundscapes, hypnotic backgrounds and intense drum structures that will evolve and modulate throughout your productions. The distinct sonic universe of Aethers fuses a peaceful introspective ambient mood with industrial sounds and comes packed with Electronic Glitchy Beats, Unconventional Processed Synths and Real Field Recordings, Glittering Ethereal Pads, Immersive Drones, Cyclic Atmospheres, Futuristic Rhythms and Cinematic Textures. Producers can expect to find 50 exclusive field recordings by Vincent using a Nagra Technology recorder and an NT4 Rode microphone to capture audio snapshots from around the globe including New Delhi, Moscow, Saint Petersburg, Paris, Saint-Malo, Chicago and London. Each recording is an audio time capsule that will add a wonderful organic sound to your productions, the occasional audio bug or outtake purposely left intact for compelling listening. The beats section features intense IDM rhythms that combine crunchy grains with irregular clicks and edgy percussion sounds. Also included are over 100 unique one-shot elements including Loud Kicks, Crispy Snares, Dirty Crystal Hi Hats, Undefined Short Noises, and consequences of insolent routings. Kit List: Nagra Technology recorder, Rode NT4, Plectrum Vital Arts, Nord Rack 2 Nordlead, Blofeld Waldorf, A3000 Yamaha, Battery 5, Razor, Kontakt & Skanner NI, TC Electronic Powercore 6000 Unit and some secret tools. In detail you can expect a whopping 3.17GB of 24Bit 44.1Khz samples including 11 Ambient things, 29 Ethereal Atmospheres, 23 Interferences, 26 Dark & Deep Loops, 24 Drone loops, 34 Ethereal Loops, 105 Drum Shots, 50 Drum Loops, 50 Field recordings 169 Rex2 Files and 90 Soft Sampler Patches for Kontakt, Halion, Exs24, Nnxt and Sfz Formats. The Collection is also available in Apple Loops and Ableton Live Pack versions to purchase separately.